When it comes to building a new home or fixing the foundation of an existing home, one option that you may have is to install helical piers to help secure it. They are generally east to install and have a design that works. However, they have gone through a few changes to get to that point over the years. The first of this type of foundation security was created in the early 1800s by a man by the name of Alexander Mitchell. They were widely used in English lighthouses. In the 1920s, screw anchors started being installed manually by the electric companies to attach wires and anchor utility poles in the ground. Helical piers further expanded in the 1950s, when the electric industry started using power-driven anchors instead of manual ones. This helped to secure heavier loads and created more opportunities for what kinds of structures could realistically be anchored to the ground. Over the next few decades, additional options were being explored until they started being used in foundations for a variety of different buildings and other uses. Today, they are commonly used in earth retention in the form of tieback anchors, for both temporary and permanent use. They are also used under the foundation before settlement, as supports for some pipes (and buoyancy control for underwater ones) and more. They are commonly used in areas where the soil would otherwise be too fragile to support such systems alone. Throughout their improvements, helical piers have helped make a lot of advancements in how structures are maintained, and in some ways they have allowed for the creation of bigger and better structures. 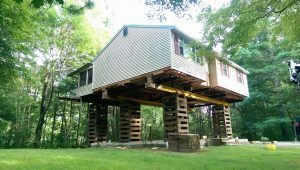 If you are looking into building a new home or repairing the foundation in your existing home, make sure that you are looking into what these support options can do you for and what your options are in the market.